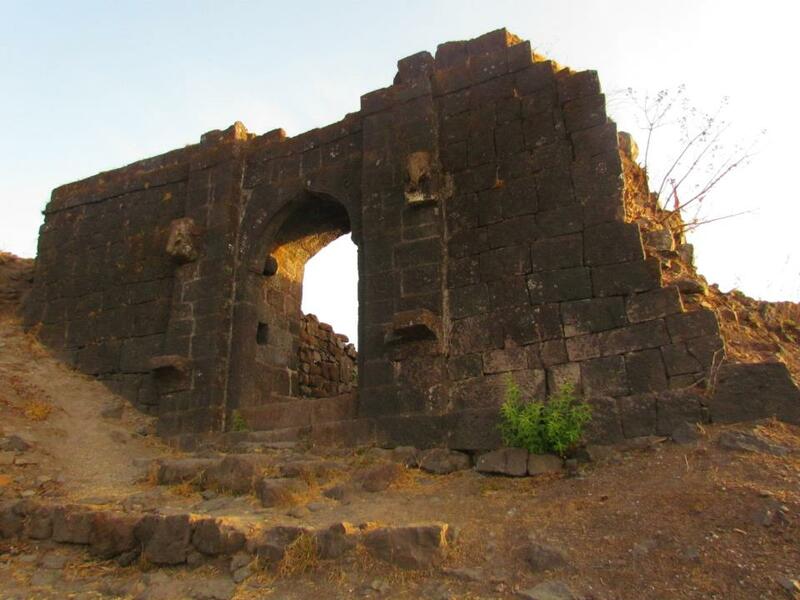 Rohida fort is situated in Rohide khore and is part of a breathtaking sahyadri ghat route from Bhor to Mahabaleshwar. This fort is also known as Vichitragad or Binicha Killa. This fort was part of Shivaji Maharaj's Swarajya (kingdom). I decided to join my Wild Trek Adventure (WTA) friends who had planned a night trek to Rohida on 20th and 21st Apr. 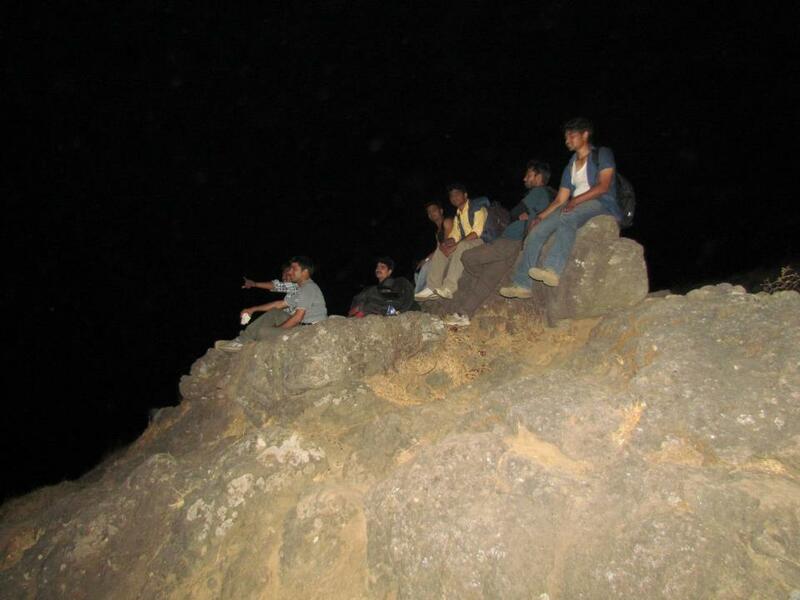 Night trek in summer always excites me and I was thrilled when my plan got finalized. 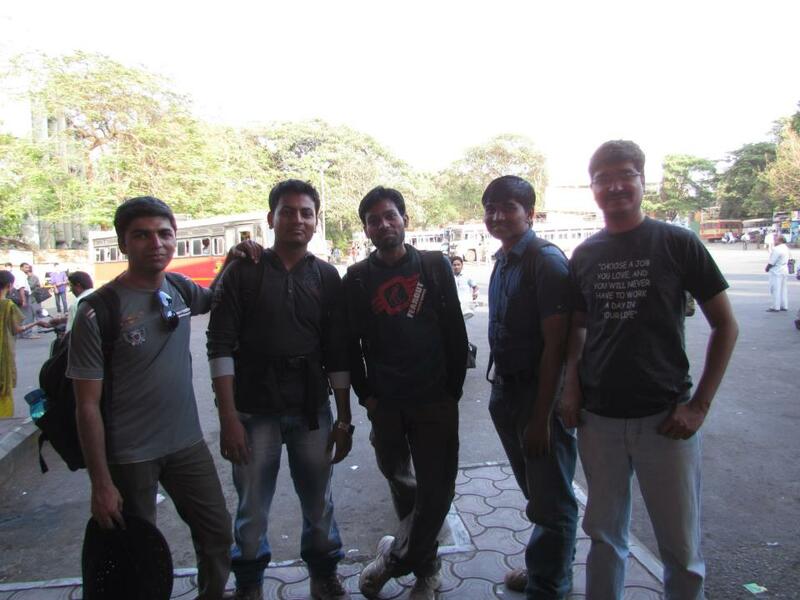 We were total 8 members (Sandip Wadaskar, Indrajeet Sonavane, Sagar Manore, Atul Ghule, Prasanna Wagh, Rupesh Kahane, Ajit Wagh) and we started from Swargate. Our plan was to travel to Bhor by bus and then travel to "Bajarwadi" - base village of Rohida fort. We boarded the bus to Bhor and started our small journey around.6.30 PM. We occupied the last seats and fortunately, there was a very little rush in the bus and we had a great time in joking, enjoying strawberries. Along the way, we enjoyed the scenes in the Katraj Ghat; traced the route of Katraj to Sinhagad trek. After a while, we spotted and marvelled at the sights of Purander and Vajragad. There is a small school in Bajarwadi from where we needed to start our night trek. As there was Ram-Navami on the previous day, there was abundant moonlight available and we started our trek under a soothing moonlight. 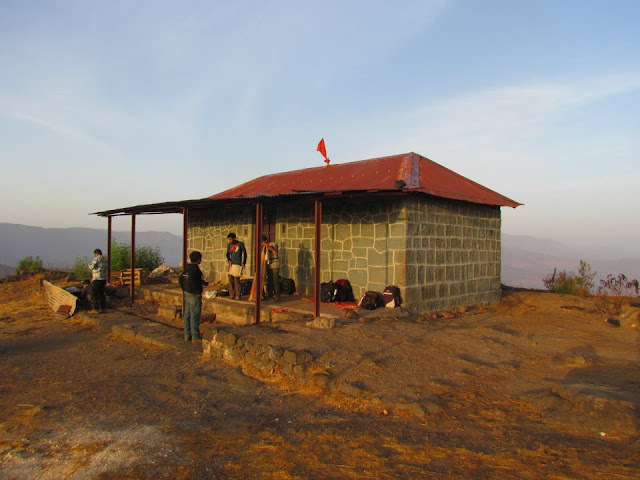 There is around 50 to 60 degrees slope while ascending Rohida and we took 2-3 small breaks and revelled at the beautiful night scenes of Bajarwadi village and Mandhardevi mountain range. We finally reached inside an hour on top. As the slope was steep, we were drenched with the sweat and we rested for few minutes before proceeding towards the Rohidmalla temple - our halting destination for the night. We were surprised to see the temple locked. This was the first time that we saw any temple on the fort locked from outside. Well, earlier we had planned to sleep inside the temple but as it was locked, we mentally prepared ourselves to sleep outside the temple. 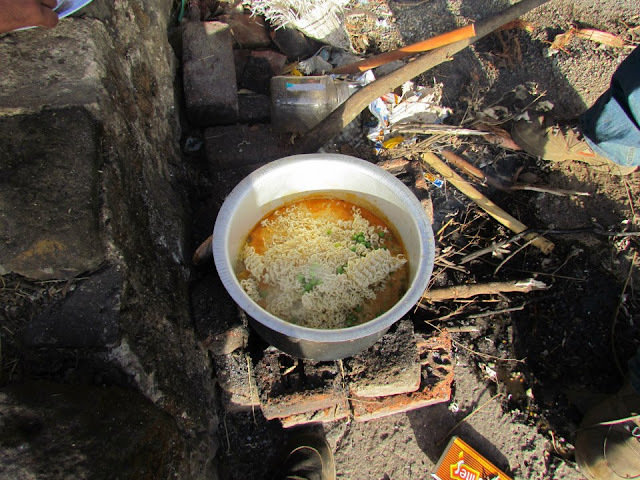 Sandip and Sagar had already carried the utensils and other food items to prepare the food on the top. So as soon as we settled, we started preparing for our dinner. Few members started cutting onions, potatoes, peeling green peas while few of us went to search for the dry woods to prepare a chullah. Fortunately, we got hold of all the required combustible material and lit the chullah. By this time, wind was blowing with a full speed and we somehow managed to cover chullah with the metal sheets lying in front of the temple. Chullah was lit properly after some efforts. Indrajeet, our Chef for the night took the charge of preparing the Biryani Rice. Rice was cooked within 30 minutes and we all started the dinner. Biryani was delicious and we all praised culinary skills of Indrajeet. After having our dinner, we cleaned the floor so that we could sleep over it. While dumping the paper plates in the bean box placed in front of the temple, a lizard jumped from it and went inside one of my pockets of my sack. Lizard was clinging inside the sack and it took us more than 5 minutes to make it come outside. Finally after a struggle of around 10 minutes, we were able to shoo away the lizard. We placed metal sheets on both sides of our sleeping place to protect us from the blowing wind and creeping animals. Finally, it was time to sleep and Sagar still had energy left to click this photo. It was almost 12 o'clock now. Suddenly the weather changed dramatically and there was a sudden dip in the temperature and there were clouds hovering around us. We literally started shivering. As we had planned to stay in temple tonight and because of the summer, most of the members were ill prepared with hardly any pull over sheets. 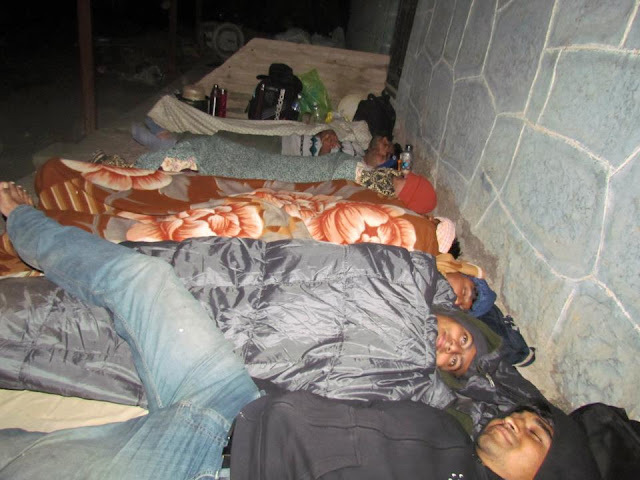 Atul and Sagar were the lucky ones as they had sleeping bags with them. Well, it turned out to be a very cold night and we tossed and turned on the cold floor whole night hardly getting any sleep. To add to our woes, Sandip woke up somewhere in night telling us to cover our ears as he spotted many ants on the floors roaming around our heads. Somehow we spent the night and got up around 5.45 AM. It was just before the sunrise and weather was clear and very pleasant. We were now eagerly waiting to witness the rising sun. Our wait was over soon and sun rose gently providing us a spectacular sight. We all were just revelling in the beautiful sights and were busy in clicking pictures in the golden hour for photography. Sagar was desperate to use his tripod and click some spectacular photos as his plan of clicking the moon at midnight was ruined by the sudden cloudy weather. Atul, who is great entertainer with his humour, appeared lost while watching the panoramic views of Sahyadri.This was the only time he appeared silent. After a sumptuous Maggi breakfast, we proceeded to visit different places on the forts. We started with the Shiravale Buruj located on the South-West side. Most of the parts of this bastion are still intact and you can spot Kenjalgad, Raireshwar and Kamalgad from this location. On the West ,there are Patane Buruj and Damgude Buruj. On the North side, there is a beautiful Waghjai Buruj. On the backside of Waghjai buruj, there is a small route from the top of hill to reach to Waghjai Temple. We wanted to visit this temple but access route to this temple from Waghjai Buruj was too dangerous. Easier route was from outside the fort and we decided to visit it sometime in the future. We then proceeded towards the East side where Sadar Buruj and Fatte Buruj are located. Fort has a great facility for storing water. Rohida has three gates while entering. Third Gate of Rohida where two elephants are carved on both sides. This gate also has Stone Inscriptions (one in Marathi language and other in Farsi language). 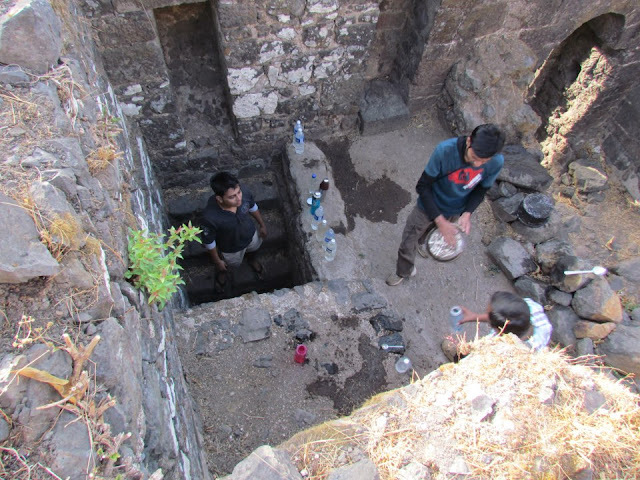 Potable water cistern near the second gate. Water here is available throughout the year. First gate from outside. This is the gate from where you enter the fort. Finally, it was time to climb down. We hardly took 25-30 minutes to climb down. There were many small and loose pebbles on the path and many of us slipped but escaped with minor injuries. 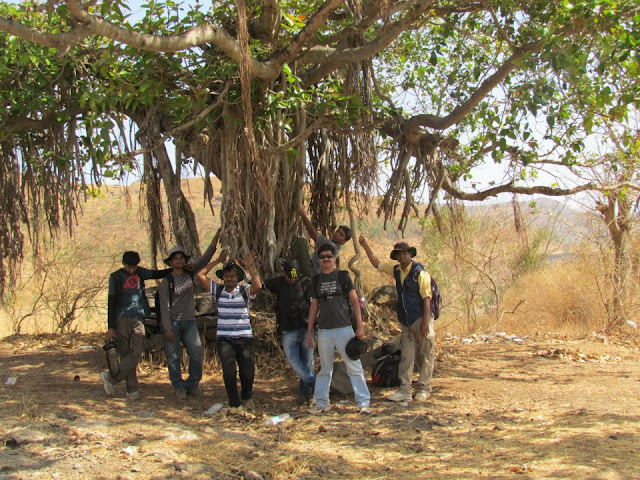 Finally, we reached at the base before it became too hot and posed for a final photograph under a big banyan tree. After coming to Bajarwadi, we immediately got a local jeep to Bhor. As some of the members were in hurry and available bus was full, we boarded a Bhor-Swargate jeep. Jeep driver dumped around 15 people in the jeep and we were cramped for the space. Somehow we managed to hold on and reached Katraj around 12 PM. I reached to home around 1 PM, had a nice lunch and slept for almost 3 hours as I was deprived of the sleep last night. Highlight of this trek was the experience of spending cold night outside of the temple. Also, witnessing amazing sunrise and great views of Kenjalgad, Raireshwar, Kamalgad, Ghevadeshwar, Torna, Rajgad, Purandar, Vajragad and Mandhardevi from the top provided indescribable satisfaction to the mind and soul.